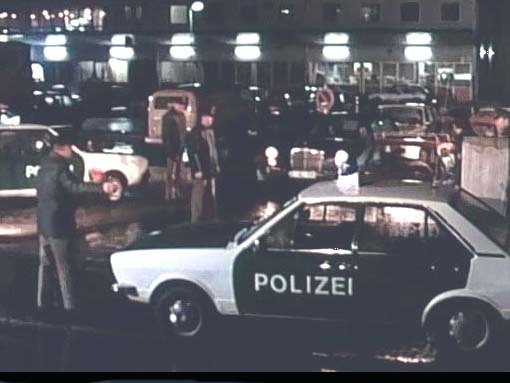 IMCDb.org: 1973 Audi 80 Polizei B1 [Typ 80] in "Tatort - Schönes Wochenende, 1980"
These police cars are special movie cars. Formerly the Bavarian Police used Audi 80 B1. In Bavaria (around Munich) they filmed the TATORTs at the big movie production company also called BAVARIA. So they used former police cars (white with green line on cars side) which being painted in other colour scheme from Northrine Westfalian Police (white with green doors and flaps). The written POLIZEI letters are also unusual.